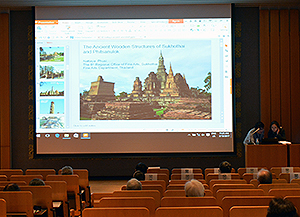 Since the August 2016 Chauk Earthquake in Myanmar, Tokyo National Research Institute for Cultural Properties (TNRICP) has been carrying out research and survey activities directed at improving the quality of the conservation work of the damaged historic brick buildings in Bagan, as part of a cooperation project commissioned by the Agency for Cultural Affairs of the Japanese Government (recommissioned by the Nara National Research Institute for Cultural Properties, NNRICP). 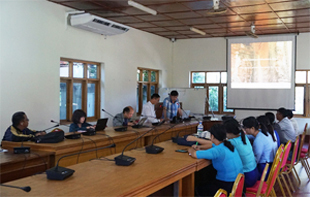 On November 13th and 14th, 2018, two workshops were held at the Myanmar Engineering Society (Yangon) and the Bagan Branch Office of the Department of Archaeology and National Museum (Ministry of Religious Affairs and Culture) respectively, to share the results of this project with local experts. Members of TNRICP and Japanese experts were lecturers at the workshops and they focused on three main topics: traditional brick masonry techniques, structural features of brick buildings, and chemical analysis of traditional mortar. In addition, local experts from each partner institution made presentations on the current state of conservation and repair works of brick buildings in Bagan. The workshops concluded with a questions and answers session and an opinion exchange between Japanese and local experts. The results of this project will be published in a report and shared with the local experts so that they can be applied further to conservation and restoration work. In addition, the Third Technical Coordination Forum for Safeguarding Bagan and the First International Coordination Committee (ICC) was held in Bagan on November 17th and 18th, 2018. The objective of the meeting, chaired by the Minister of Religious Affairs and Culture, was to share information and coordinate efforts between different local and foreign expert teams carrying out conservation work at Bagan. Experts from TNRICP took part in the meeting and made a presentation on the currently ongoing cooperation projects by TNRICP and NNRICP. 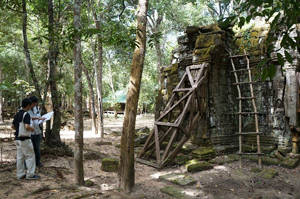 The Tokyo National Research Institute for Cultural Properties has been carrying out technical cooperation with the Authority for the Protection and Management of Angkor and the Region of Siem Reap (APSARA) in order to draft a conservation and management plan for Ta Nei Temple in Cambodia. From November 28th through December 8th, 2017, we conducted an archaeological investigation and a risk assessment for the structures at Ta Nei Temple for the second time. The main purpose of the archaeological investigation was identifying the remains of the east approach to the temple located at its front and the remains of a structure situated on the upper surface of the embankment of the East Baray reservoir discovered during the first investigation in July. 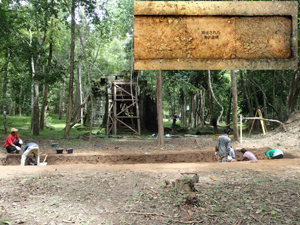 The excavation was conducted jointly with staff from APSARA and with the cooperation of the Nara National Research Institute for Cultural Properties. First, we set up and excavated a trench 2 m wide from east to west and 5 m long from north to south, approximately 50 m to the east of the east gate. We discovered a hardened surface, presumably the old approach to the temple, 70 cm beneath the current ground surface. The hardened surface was composed of yellow soil covering a layer of small sandstone gravel 5 mm in size overlapped on a layer of fist-sized sandstone cobbles. 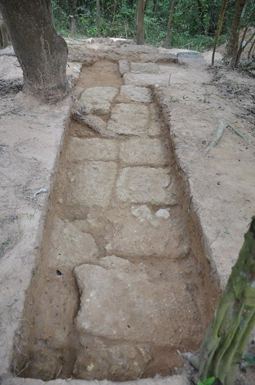 In addition, we set up and excavated a trench 11 m long from east to west and 1 m wide from north to south on the embankment of the East Baray on the prolongation of this approach way. We found a laterite stone surface 30 cm beneath the current ground surface (Figure 1). Considering the surrounding topography and the distribution of exposed laterite, these remains can be presumed to form part of a terrace structure approximately 20 m long from east to west and 15 m wide from north to south. Regarding the risk mapping of the site, we examined how to renew the existing temporary supports. Wooden supports had been installed in 16 places where there were safety concerns such as potential collapse of main structures, including the central tower, the east tower, and the inner gallery. However, apart from obstructing the view of the site, these supports are in need of renovation, as in the 20 years that have passed since their installation decay of timber members and loosening of joints have become apparent. Thus, we observed and recorded the current condition of these supports, and studied improvement proposals including a change to a more durable material and the adoption of a design enabling fine adjustment. 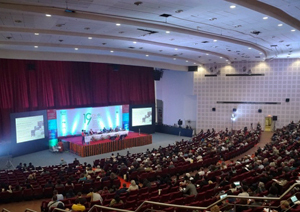 The 19th ICOMOS General Assembly and Scientific Symposium was held in Delhi, India from 11th to 15th December. The author took part in the General Assembly and made a presentation at the Symposium. During the General Assembly, the triennial elections for the Executive Committee were held. Professor Toshiyuki Kono from Kyushu University was elected as president, becoming the second Asian and first Japanese president of ICOMOS since its foundation in 1965. 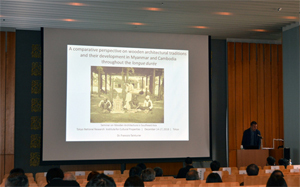 Professor Kono has had a leading role in several initiatives engaging current issues surrounding cultural heritage from multiple perspectives, including the Convention for the Safeguarding of the Intangible Cultural Heritage, the Nara+20 Conference and the ICOMOS Project on Cultural Heritage Recovery and Reconstruction. The further development of such initiatives during his three year term is highly anticipated. In addition, the General Assembly officially adopted the “Principles for the Conservation of Wooden Built Heritage”, redacted by the ICOMOS International Wood Committee (IIWC). This document is an updated version of the 1999 charter by the same committee. The updated version is more detailed and concrete, while at the same time placing a renewed emphasis on the intangible aspects of wooden built heritage. The General Assembly also saw the adoption as one of its resolutions of a proposal redacted by the Emerging Professionals Working Group, aimed at strengthening the involvement of emerging professionals in the activities of ICOMOS. At the Scientific Symposium, under the title “Heritage and Democracy”, speakers from different countries presented initiatives aimed at involving actively in the conservation process the local communities and other stakeholders who maintain, use and safeguard the heritage. As an example of such initiatives in Japan, the author made a presentation on the “heritage manager” system. On August 24th, 2016, a magnitude 6.8 earthquake with its epicenter in the central part of Myanmar struck; as a consequence, the ruins of Bagan, one of the representative cultural assets of the nation, suffered serious damage. The group of ruins in the region includes more than 3,000 brick Buddhist stupas and small temples built mainly in the 11th to 13th centuries. According to the Department of Archaeology, National Museum and Library, Myanmar Ministry of Religious Affairs and Culture, 389 of these sites were discovered to have been damaged (as of the end of October 2016). Following the dispatch of an advance inspection team in September,2016, the Tokyo National Research Institute for Cultural Properties (TNRICP) was commissioned by the Agency for Cultural Affairs to oversee a project to provide emergency aid and sent a party of eight specialists (on conserving cultural assets, repairing buildings, structure of buildings, and surveying) to the sites with the aim of identifying the actual state of quake damage to valuable cultural properties, from October 26th through November 10th, 2016. They conducted surveys from four standpoints, namely, the situation of damaged historical buildings, the structural analysis of damaged buildings, the situation of emergency protective measures, and the analysis of records of damage. The ruins of Bagan sustained quake damage in 1975 as well, and a large number of structures had been restored or rebuilt thereafter. As a result of the current inspections, however, it was discovered that much of the damage from this earthquake was concentrated on the newly reconstructed parts or the boundaries between the newly repaired parts and old parts, such as a tower of the upper part of a building. Moreover, deformation or cracks existing in vaults, walls or podiums owing to age are believed to have been aggravated by the earthquake. Meanwhile, thanks in part to prompt actions by local residents and volunteers under the leadership of local authorities, emergency protective measures appear to have been taken in an expeditious manner. With an eye toward subsequent restoration, we must identify the cause and mechanisms of damage by not only conducting further inspection but also discussing the technical and philosophical issues that are common to the conservation of brick architectural heritages in earthquake-prone regions, such as how to reinforce a structure, melding of traditional techniques and modern counterparts, and the validity of reconstructing damaged parts.